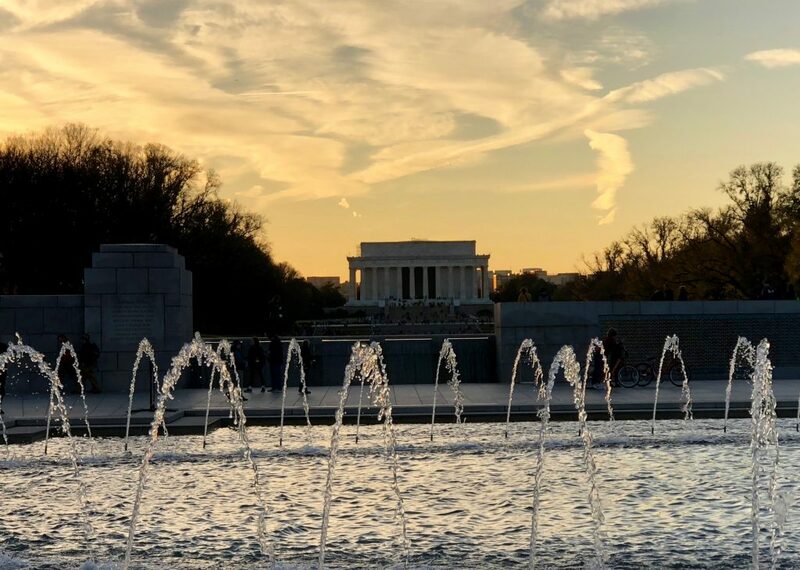 The west end of the National Mall in Washington D.C. is full of iconic monuments and memorials that most people have only seen on the back of their money. We explored many of these monuments in one walk with our young children. We enjoyed this walk in the evening when the monuments are lit up and the rest of Washington DC is closed for the evening. The monuments are considered open and many have National Park Rangers there to answer questions until 11 pm. But the monuments are a great sight no matter what time you visit. 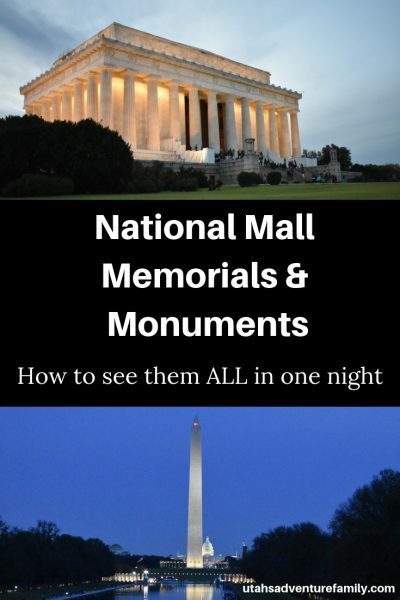 In this post, we will share the route that we took so that you can see all the National Mall Monuments and Memorials in one night. We also share out tips for visiting, too. Parking is the biggest worry in Washington D.C. If you can take public transportation, that is the best option so that you can avoid parking. We came straight from the airport to visit the monuments, so we had our rental car. 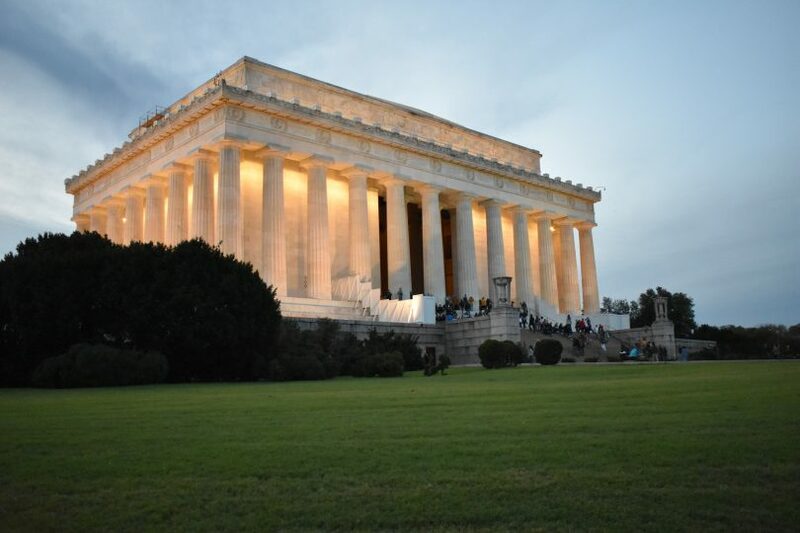 There is limited parking near the Lincoln Memorial and the Jefferson Memorial. This is a picture I snapped of a sign so we could follow our route. We parked near that sign that says “water taxi.” The Jefferson Memorial is cut off in the bottom right corner. 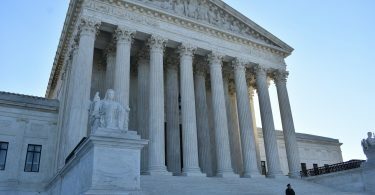 You may be lucky enough to find parking south of the Lincoln Memorial. We parked on Ohio Drive near West Potomac Park and only paid two dollars per hour. This is central to the monuments walk and gives you a rare place to stow the car. 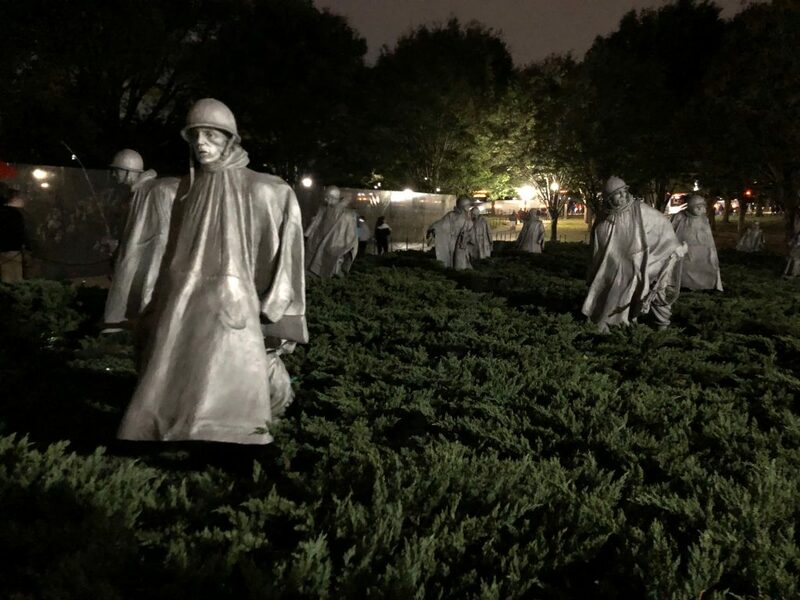 The Korean Memorial is haunting in the dark. You feel like you are right there with the soldiers. 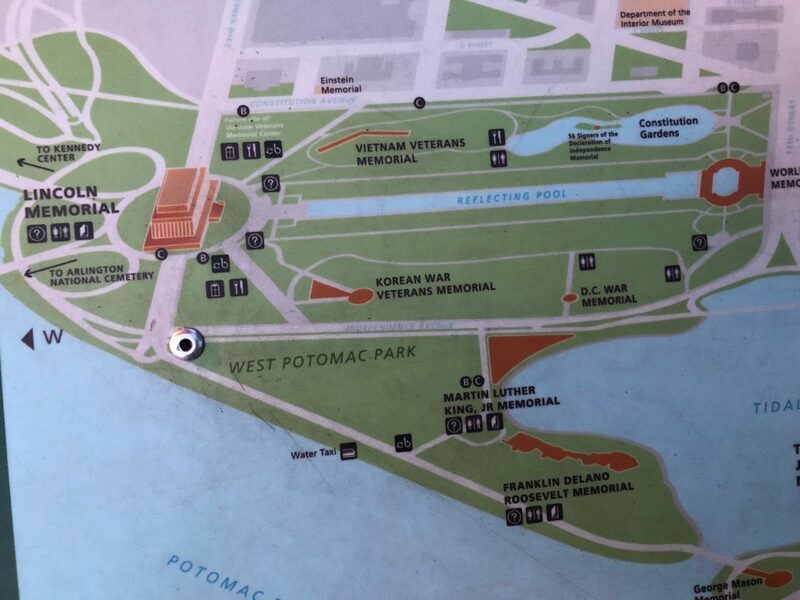 We began our route at the Korean Memorial because it was the closest to where we parked. You could begin this route from a different spot, and continue the loop from there. The Korean War Memorial is one of our favorites. 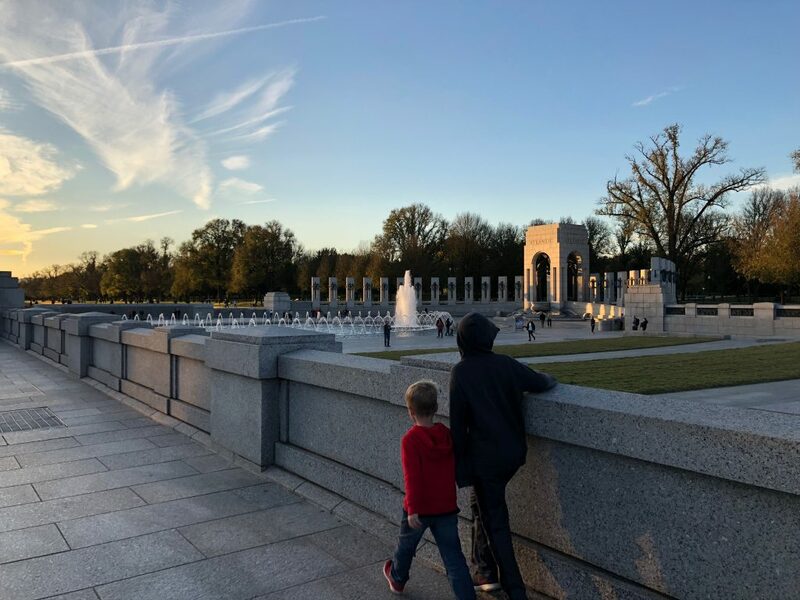 Our 9 year-old said that he felt “like a soldier marching in the war.” The monument depicts the soldiers walking east with all their military gear. 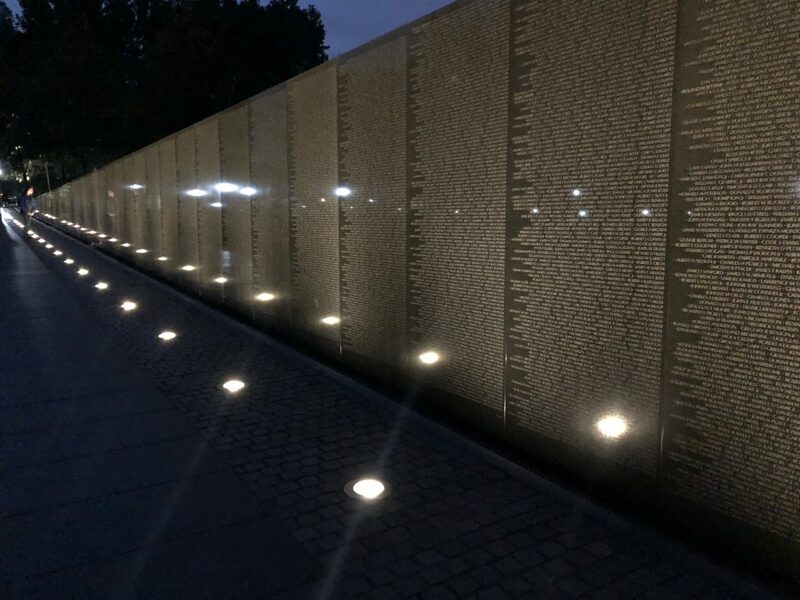 A reflecting wall has pictures of soldiers etched into it like ghosts, and the names of all the countries that participated in the conflict with the United States are etched into a low wall. 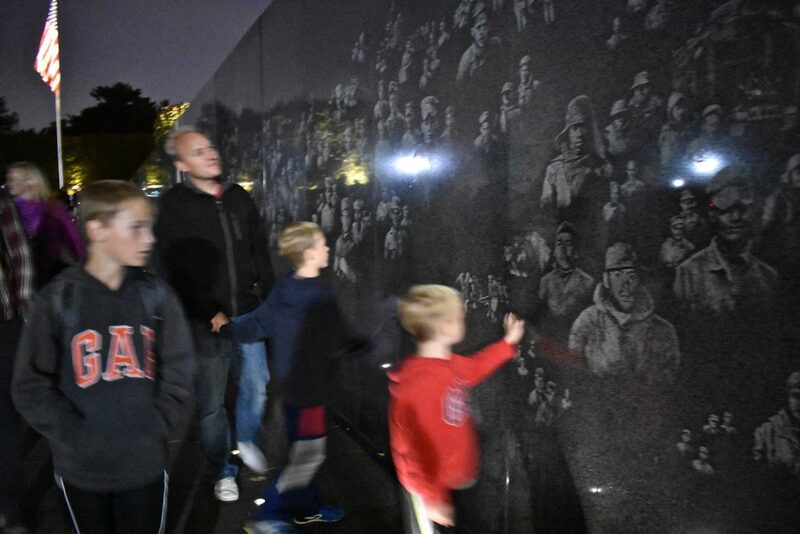 I know this picture is blurry, but I loved how it shows our boys enjoying this memorial. A view of the The Lincoln Memorial from the World War II Memorial. After spending some time with the soldiers, turn left (west) and walk over to the Lincoln Memorial. The views to the east of the Capitol and Washington Monuments are breathtaking. The Lincoln Memorial almost always has dozens, if not hundreds, of people on the steps. Still, as you approach the alcove you know you are in a special place. This is where Martin Luther King gave the I Have a Dream Speech and where the monument was dedicated before a segregated crowd in 1922. There is a museum underneath on the south side and a tiny gift shop upstairs on the north side. 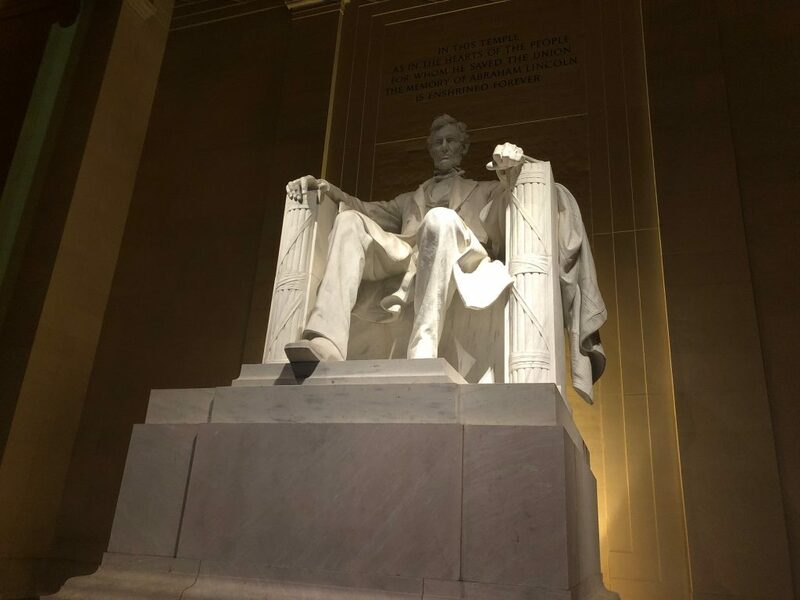 Lincoln is impressive to see. There are so many names on this wall. It is humbling to see. 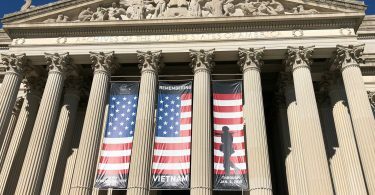 Go back down the steps and turn left to visit the Vietnam Memorial. It is only about a hundred yards to this monument. There are over 58,000 names etched into the reflective wall. If you stand close to its mirrored surface you can clearly see your reflection and contemplate how you fit into the names written there. This memorial is simple but meaningful. Our boys were stunned at the Vietnam War Memorial. Make sure to look into the wall at your own reflection. This memorial was added to the National Mall in 2004 by George W. Bush. Continue east and pass the Constitution Gardens to find the World War II Memorial. This large circle of stones features a large fountain in the middle. There are two large pillars that face each other to the north and south. One of the pillars, inscribed with Atlantic, represents those who fought against Germany on the eastern front. 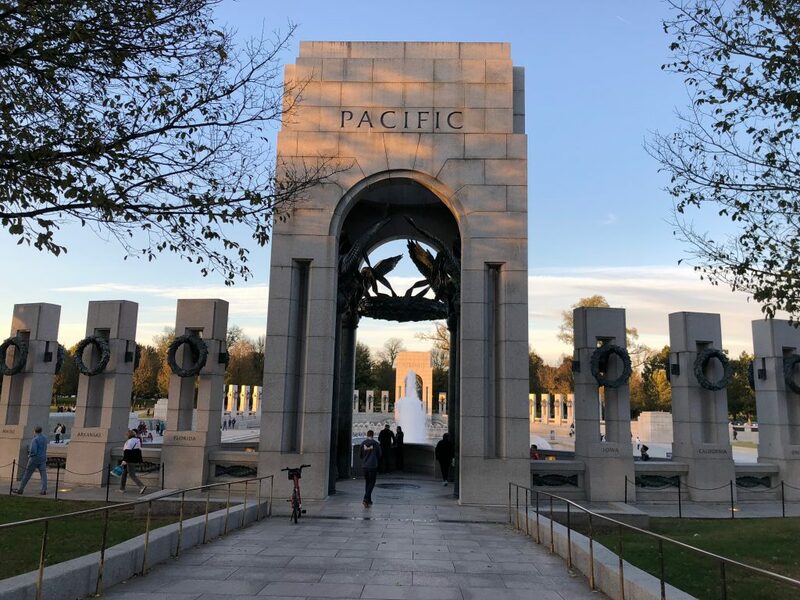 The other pillar reads Pacific representing those who fought Japan on the Western front. Most impressive is the freedom wall, which has 4,048 stars, each star representing 100 soldiers who died during the War. This is the best vantage point for the Capitol and the Washington Monument. Get any closer, and you can’t fit the towering obelisk in a photograph anyway. 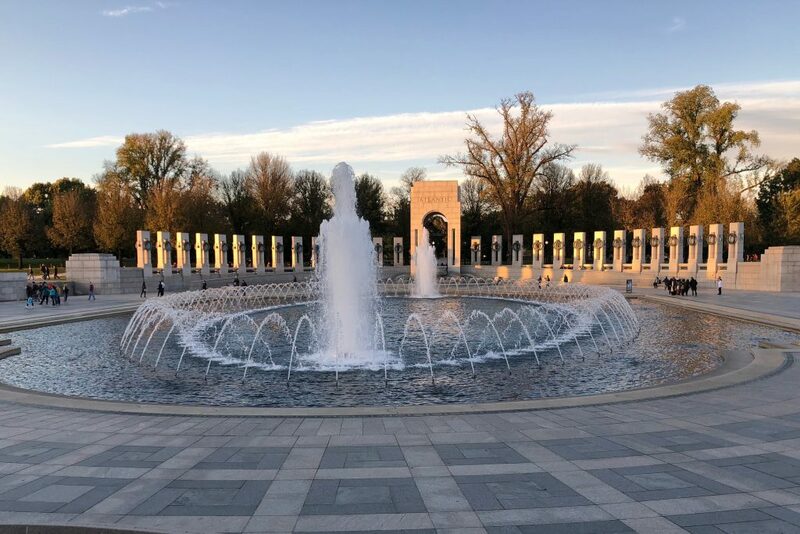 We really liked the World War II Memorial. Loop back around to the right (west) and the DC War Memorial comes into view. This small monument was originally built as a bandstand where patriotic music could be played to honor veterans from the District of Columbia. It now stands as a tribute to those soldiers. This memorial is small, but still beautiful. We loved the quotes from Dr. King all around this memorial. Cross the street to the south and enter the Martin Luther King, Jr Memorial. 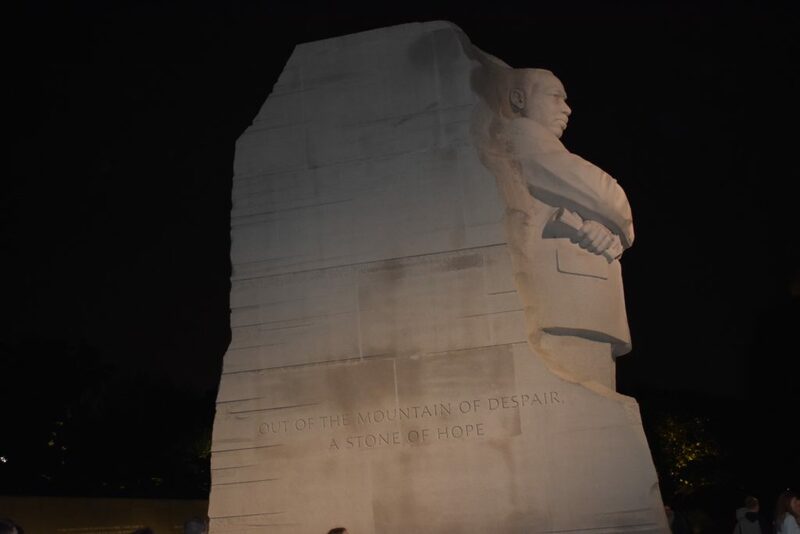 This amazing monument shows Doctor King cut out of the mountain and towering proud and determined over the crowd. There are a dozen or so beautiful quotes that brought tears to our eyes and made us think about the kind of people we are trying to be. This was our favorite monument and shouldn’t be missed. 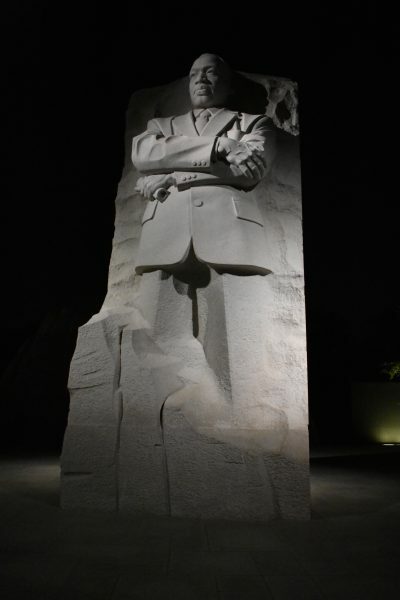 The carving of Dr. King is very powerful. 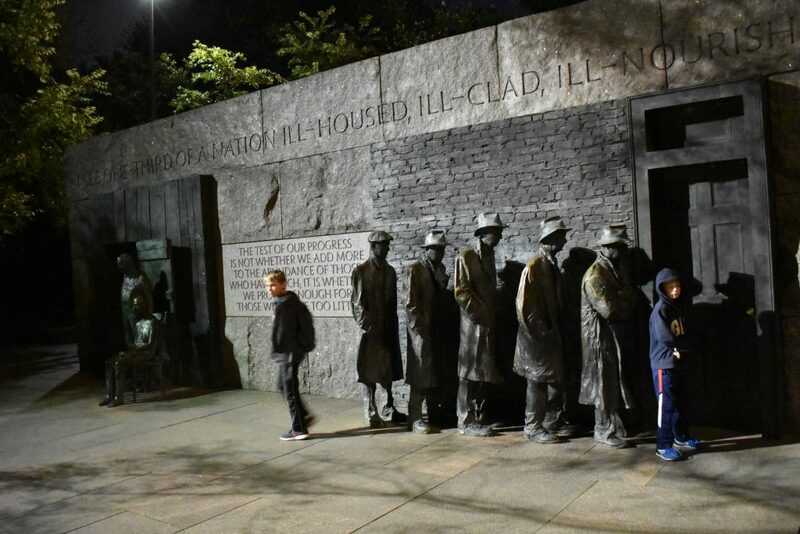 We were impressed with the size of the FDR Memorial. There is a lot to see! 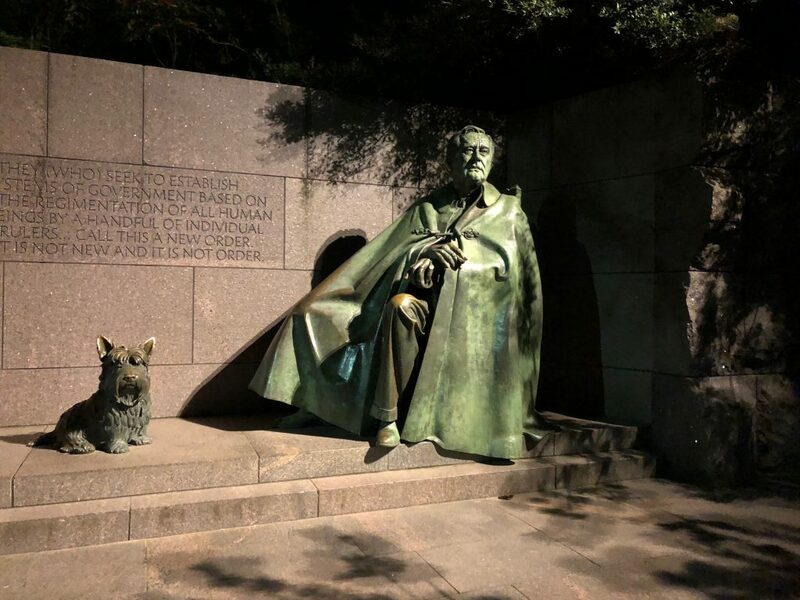 Further south is the Franklin Delano Roosevelt Monument. When you first enter it seems small, but there are three different outdoor “rooms” as the monument sprawls larger than expected. There are waterfalls and quotes on the walls as well as a few opportunities to take pictures with President Roosevelt and his wife Eleanor. There was even a spot for fireside chats over the radio and a ration line to remind us of the accomplishments of FDR. 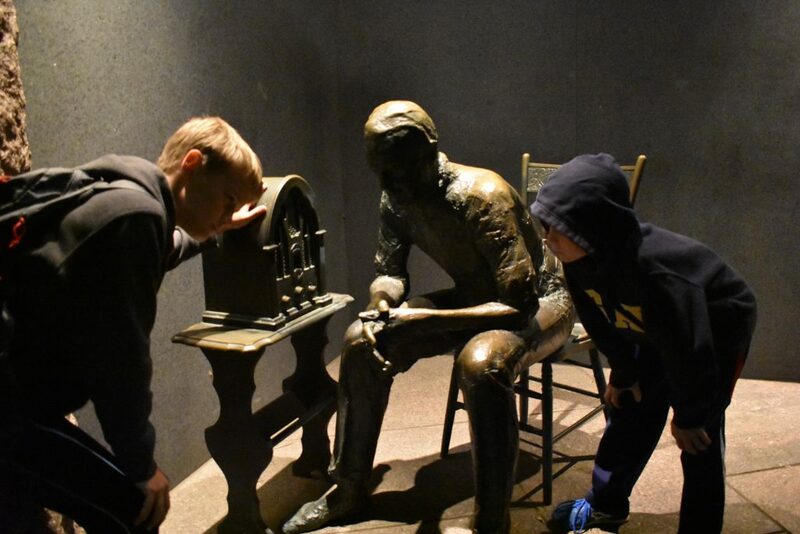 This section recalled FDR’s Fireside Chats. FDR’s New Deal in response to the Great Depression. 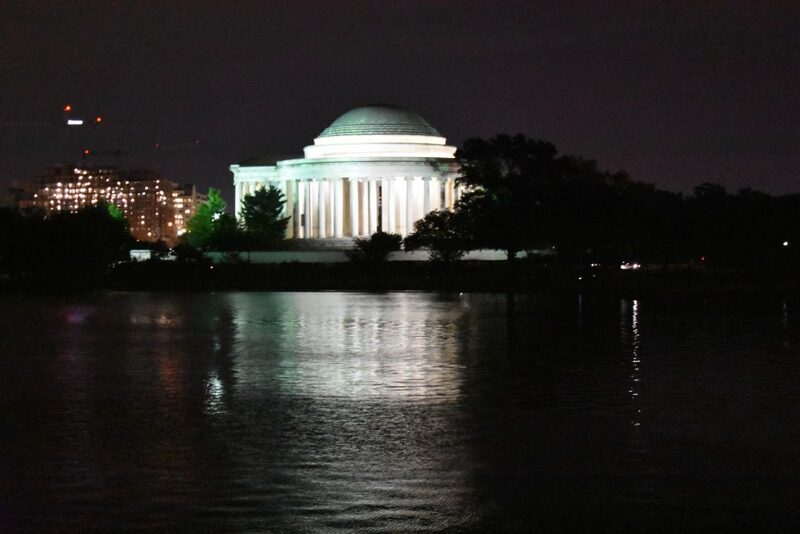 The Jefferson Memorial is beautiful at night. Continue south and to the left and cross a narrow bridge over an arm of the Potomac. It’s a bit of a walk, but the Jefferson Memorial is worth it. 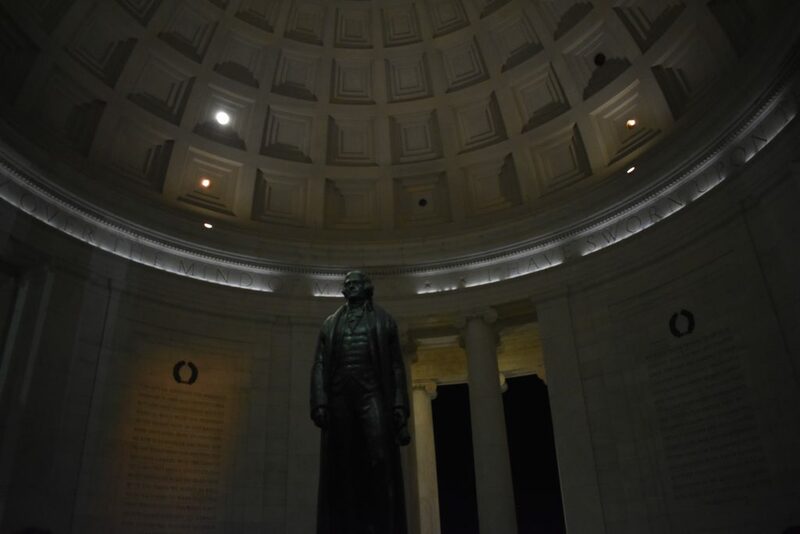 The stone shines out brighter than any other memorial and a massive statue of Jefferson stands in the middle. There are towering pillars and the lighting is much better than at Lincoln Memorial. You can also see the White House peeking over the trees to the north as you leave the monument. Jefferson has a large dome with a great echo. 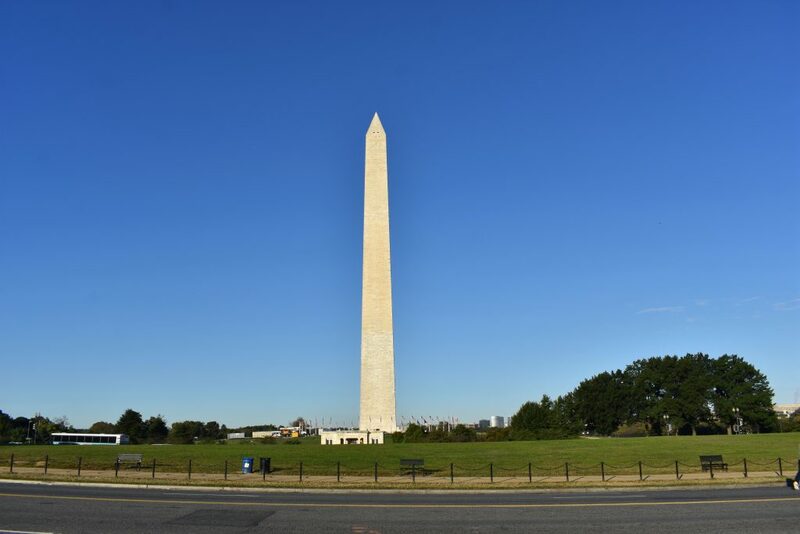 The Washington Monument is definitely an iconic site to see. You probably noticed that we skipped right past the Washington Monument. When we were in DC, the monument was closed for renovations. We also felt that we could see the Washington Monument from almost anywhere on the National Mall and still get a great picture. We also walked passed it two other times on our adventures in Washington D.C., so we didn’t include it in our Memorial route. If you plan to visit this monument when it is reopened, go during the day anyway, so you can go inside. Make sure to prepare your children to show reverence and respect at these memorials. Wear Good Walking Shoes. The walking distance on this route is only about 2 miles and our boys made it without any problems. We also had been on an airplane and not walking through DC all day. So make sure to think about the stamina of your children (and yourself). Visit at Night. We felt that our night visit was perfect. It was less crowded and many of the memorials felt extra special in the night lighting. Prepare your Children. 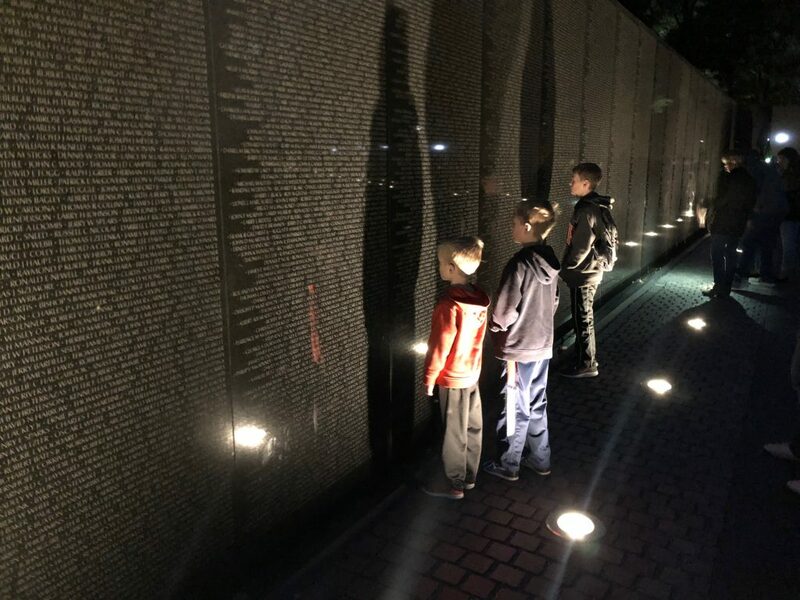 These memorials are very sacred, so we talked with our kids about showing respect by whispering, not running, and thinking about the people who sacrificed so much for us. Junior Ranger Program. 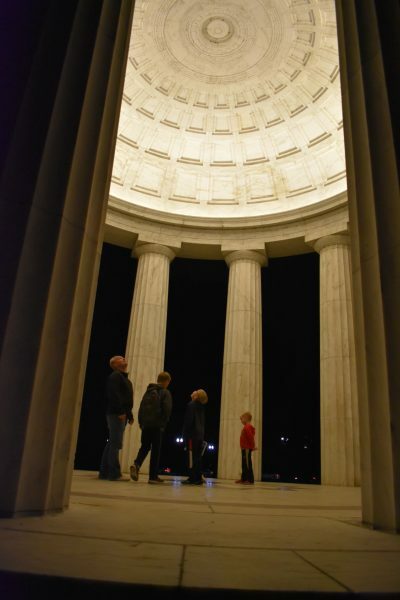 There is a Junior Ranger program for the National Mall, which is mostly about the memorials. We printed this off before we arrived, and started working on the plane. You can also pick them up at a Ranger Kiosk. 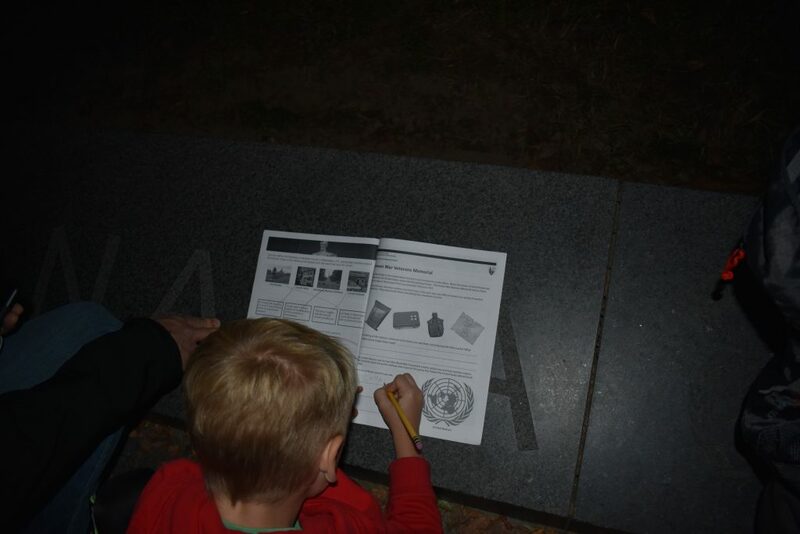 There is a page for each memorial which is a great way to help the kids learn about the memorials, as well as sit quietly and think for a minute. The tricky part is turning the booklets in. You have to find a Ranger Kiosk, and turn it in when someone is there. There are Kiosks at the Korean War Memorial, Vietnam Veterans Memorial, and the World War II Memorial. We had to bring our booklets back another day. 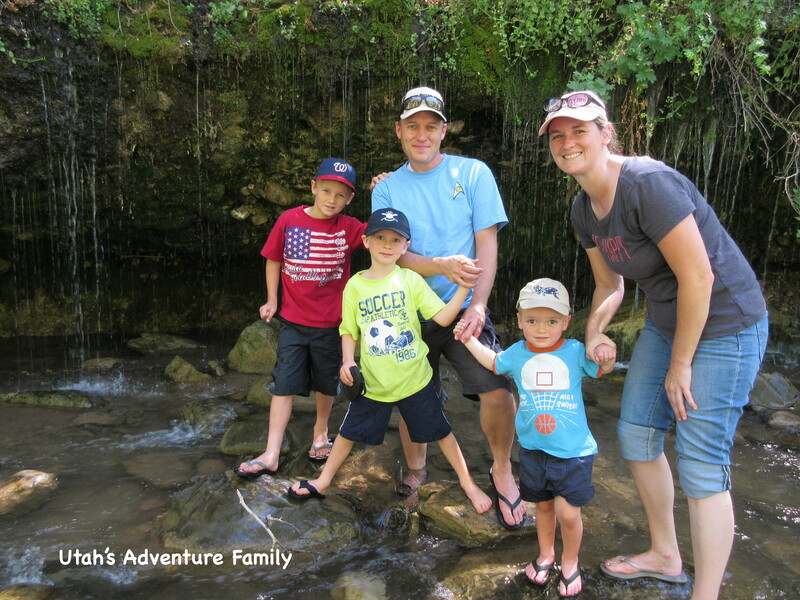 The Junior Ranger program is a great way to learn as you visit the memorials.